These 14kt white gold cubic zirconia hoop earrings for women bear 178 cubic zirconia rounds arranged inside out in triple rows. 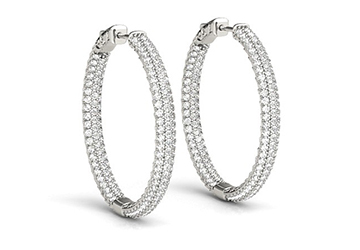 These cubic zirconia hoop earrings bear 3 CT TGW and they exude charm with their brilliant gem arrangement. April birthstone jewelry. 10th wedding anniversary gemstone jewelry.